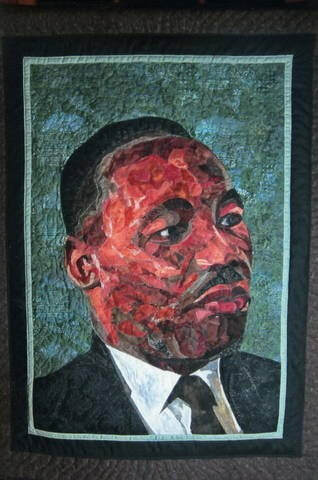 Martin Luther King portrait quilt created by Ronna Tyson. 43" x 33.5"
The next meeting of the Manhattan Martin Luther King Jr. memorial committee will be Thursday April 18 at 7 pm at the First Congregational Church, 700 Poyntz Ave. Hear and see the creative work of the finalists from the MLK Jr. Art and Writing contest. Share in the words and music of the Civil Rights movement. Dr. King’s words about love, social justice and service can be heard in faith communities throughout the community. Check your faith community for service times and locations. Join us in prayer, reflection and breakfast. Join the Staley School of Leadership Studies, Kansas State University, and the surrounding Manhattan community for the Martin Luther King Junior Day of Service on Saturday, January 26, 2019.